Edmonton's established neighbourhoods have changed over time and continue to evolve. The City must keep these neighbourhoods thriving by providing diverse housing options for residents with various housing preferences and needs. Effectively using land and infrastructure no longer required for schools is one way the City is helping to provide Edmontonians with more housing choices. We need more seniors’ housing as Edmonton’s population ages. In 2006, one in five Edmontonians were over the age of 55. By 2041, one in three residents will be over 55. Surplus school sites dedicated for seniors' housing have access to public transit and are near parks and amenities. Seniors' housing on these sites will allow many seniors to downsize from detached homes while remaining in their community, close to their friends and within a familiar neighbourhood. Edmonton needs more affordable housing for seniors on fixed incomes. The Sakaw Terrace seniors complex will provide units for those needing both affordability and accessibility. The City and GEF Seniors Housing know that soccer is important in this area and the location where the seniors complex is being constructed has a long history of being where so many neighbourhood children grew up playing. 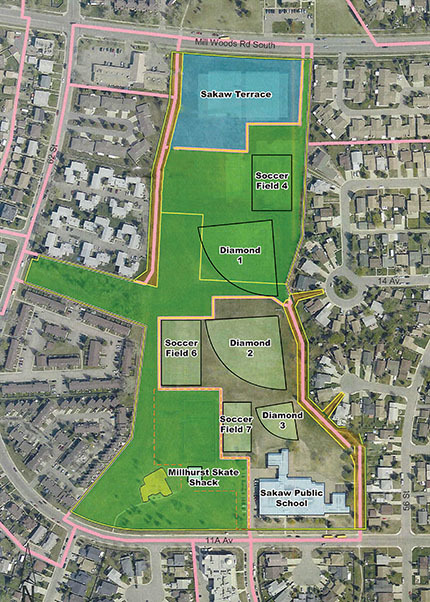 While the two temporary soccer fields that were located on the Sakaw Terrace site will no longer be available during construction and after the seniors complex opens, the three other soccer fields and three baseball diamonds on the Sakaw school park site will remain usable. The soccer field (#4) adjacent to the construction site has been relocated and configured a safe distance away from the construction site and will be ready when sports fields open for the season. Due to wet conditions, the sports field opening date for the season has been pushed back to May 8, 2017. For more information or questions about sports fields bookings please email sportsfieldbookings@edmonton.ca or call 780-442-4548. 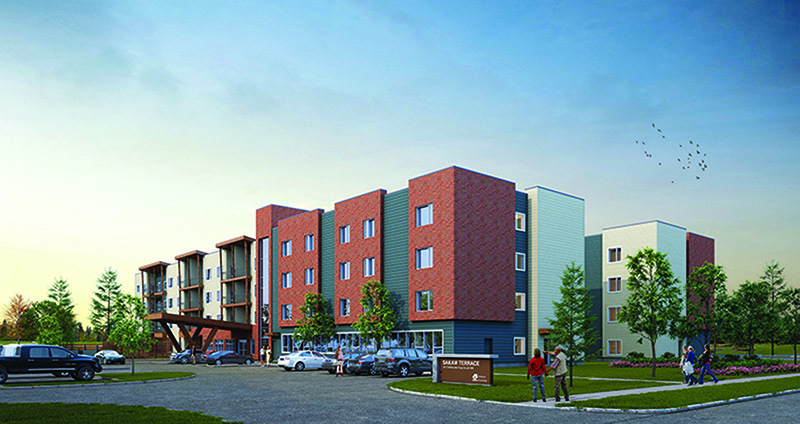 The City and GEF Seniors Housing engaged local residents and community groups to gather their input on the design of this project. November 2014 - A public meeting in November 2014 gathered feedback from residents about more detailed architectural designs. For more details on this meeting, see the meeting display boards. May 26 and September 11, 2014 - Public meetings were held to discuss the project with residents and interested stakeholders, and gather initial feedback. Attendees provided valuable input on the potential design of the development and desired amenities. Please refer to GEF Seniors Housings’ Sakaw Terrace Facebook group or visit the City’s surplus schools site frequently asked questions page.